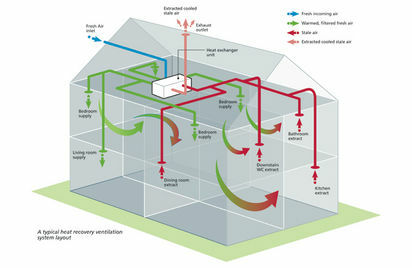 Why Consider A Heat Recovery & Ventilation System? To ensure that you are saving energy but also creating a healthy home, it’s vital to consider how the house is ventilated. Whole mechanical ventilation with heat recovery (MVHR) systems are a solution. They exchange stale air for fresh air, and recover heat in the process. An MVHR system will extract the warm, moist air from rooms such as kitchens and bathrooms. This is done through a concealed duct system. The air is passed through a heat exchanger then ducted outside. Fresh air from outside is drawn in and passed through the heat exchanger, which warms it, and it’s then ducted to the living rooms and bedrooms. Some systems have a feature so that when it’s warm outside, the air can bypass the heat exchanger to help keep the house cool. The systems often have two speeds, so when the kitchen and bathrooms are being used – and producing lots of moisture – the extraction rate can be boosted. If you’ve built an energy efficient house, then the system can meet part of the heating needs of your home, as well as helping to distribute the heat. If you are building to Passivhaus standard, MVHR will contribute to satisfying the requirements. Many systems come with air filters, so they’re helpful in preventing potential allergens entering the house. Changes to the building regulations in October 2010 mean that ventilation provision in new houses must be commissioned by a suitably qualified person using calibrated test equipment.